Autumn begins with a trippy out of body experience- there’s definitely a beach, possibly a dead body, definitely a copse and trees, sand and leaves and nature. It’s ethereal and floaty, dreamlike and disorientating. Having read Lincoln in the Bardo, this summer I was expecting it to be some kind of purgatory, because it seemed oddly familiar. We eventually learn that this is Daniel Gluck, one of two characters that will recur at different times, at different ages throughout the novel. The next time we see him, slightly more corporeally, he is 101 and clinging to life in a soulless care home. Next we meet Elisabeth Demand, a thoroughly modern just-about millennial, over educated and under employed. Scraping an existence as a casual contract lecturer in Art History, she seems harassed, unfulfilled and adrift in a world that she no longer recognises. The first time we meet her is to observe a farcical, almost Fawlty Towers-esque ordeal with the bureaucratic minions at the Post Office involving head sizes, deli tickets and the humourless jobsworths that work there- the erosion and decay of Public institutions and social bankruptcy are recurrent themes throughout. The Post Office, on this visit, is full of homeless people as the library has closed. The book declares itself to be the first post-Brexit novel, and it captures the melancholy betrayal of a divided and abandoned nation, one that is confused, angry and adrift. I loved the book just for how disappointed it is in people. It’s not really a hopeful story, there’s no suggestion of a conclusion and that fits how us official 48% feel about pretty much everything. As a child, Elasabeth lived next door to a late 70s aged Daniel- their friendship was an odd one, encouraged by Elisabeth’s mother when she needed a babysitter, recast as suspicious if she thought about it too hard. The sprightly for his age Daniel taught his young neighbour to think, to imagine, to wonder. To see things that weren’t there and change things that were. He seems to be one of the first people to really recognise Elisabeth’s intelligence, and he treats her like an equal. We also get a glimpse of his immigrant backstory and his lost sister, a woman that Resisted and was promptly never heard of again. Elisabeth’s mother, the only other character we really see much of is an odd woman, to begin with almost Mrs Wormwood-ish in her brashness and presumed negligence. When her daughter is young, she seems reckless, irresponsible. She lies to her kid about where she’s going and Elisabeth is smart enough to see through it with adult-level cynicism and exasperation. Mum encourages her daughter lie about her homework and leaves her in the practically stranger danger hands of a next door neighbour. Later on she is suspicious of their friendship, wilfully and frustratingly misunderstanding their shared love of art as something sinister and inappropriate. After moving to the village in later life, she becomes this liberal antiques enthusiast, lamenting the hate crime wave and railing against the lies and the wilful ignorance. 25 years makes her unrecognisable. 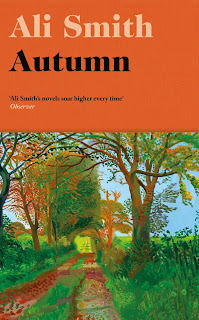 I don’t know what that means, but Ali Smith never makes it seem like a mistake. It’s just mysterious people being mysterious. Autumn is a non-linear novel that flits around between Elisabeth’s lifetime- the art dissertation she wrote on a forgotten British pop artist, her canalside walks as a child with Daniel, sat at his bedside in the present day reading Brave New World. The prose is beautiful and powerful, a slideshow of images and emotions. It manages to be both playful and furious at the same time, which I was incredibly impressed with. I love books that have art as a central theme, how art makes a person feel. It’s fascinating to have such visceral and personal responses captured in prose, which is one of the elements that I found the most joyous about How To Be Both.